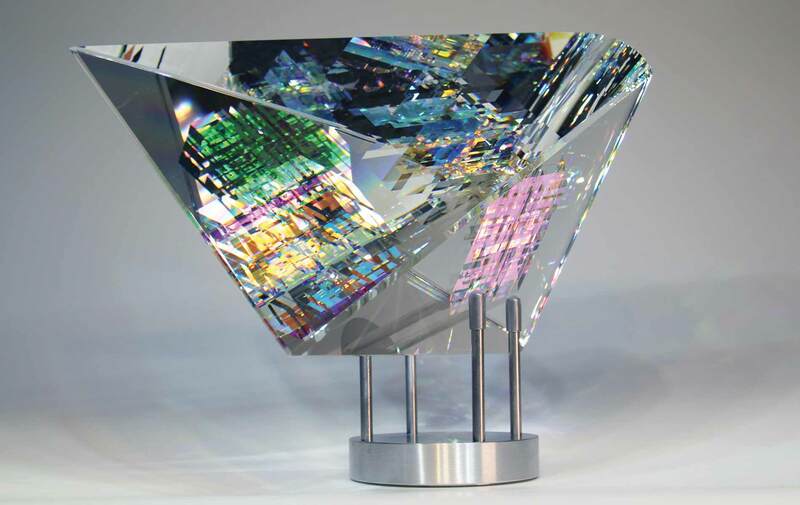 Jack Storms’s Lumiere glass sculpture is named for the light it exudes from every curve and angle. 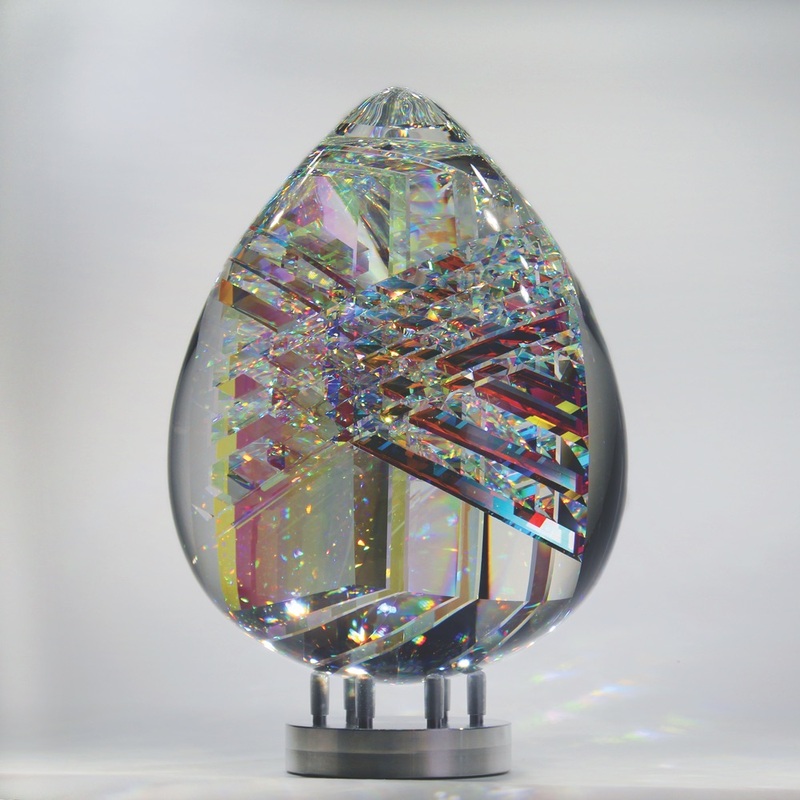 After the storm comes a brilliant rainbow of colors, and this time, it’s in the shape of mesmerizing glass sculptures. If you’re familiar with the works of contemporary artist Jack Storms, chances are you’ve spent hours at a time online watching videos of his hypnotizing creative process. What makes his artwork so captivating? 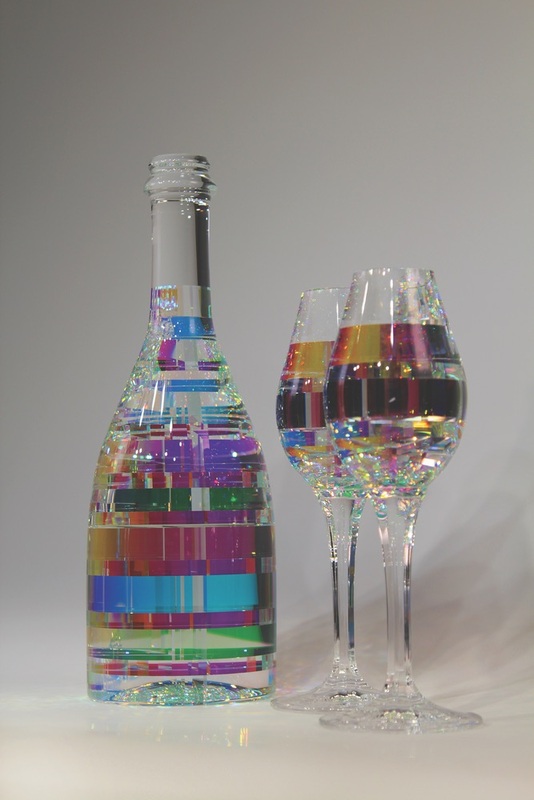 These aren’t glass figurines that you’d find in department stores or the average glass-art studio. 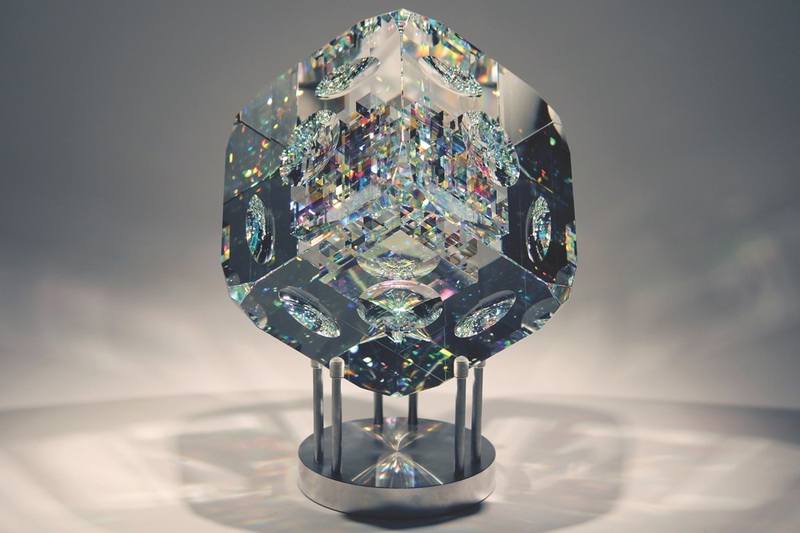 That’s because Storms’s sculptures are shaped and formed using what’s known as the “cold working” method, a technique that’s rare because most glass artists do not undertake the endeavor. Cold working is a method that involves meticulous crafting skills, working with glass while it’s in its cold or annealed state. Unlike traditional hot glass working where glassmakers manipulate the shape and color of the fiber while it’s hot and flexible, a variety of techniques are used to create the complexity visible in Storms’s glasswork. These include sandblasting, cutting, grinding, polishing, and engraving. It’s a much harder skillset to acquire, but the effects are spectacular and certainly worth the extra effort. It’s how each piece gets those stare-inducing translucent color effects. With an intense interest and passion in art that emerged when he was a young child, Storms knew that was what he wanted to pursue as a career. “I was always good at art and fell in love with the process,” he explains. Fast-forward a couple of decades when, at the age of thirty, Storms earned his bachelor’s degree in art with a focus on studio production from Plymouth State University. At that moment, unbeknownst to him, he was on the brink of finding his place in the art world. He quickly buffers that thought, though, saying, “I always knew if you take art seriously, you can make it a career. With a positive attitude, determination, and a vision for possibilities, Storms started to look for professional art studios that could use his skills. He landed a position with a fiber optic sculpture studio and immediately found his calling. “The second I was there, I knew it was something I was going to do for the rest of my life,” he says. 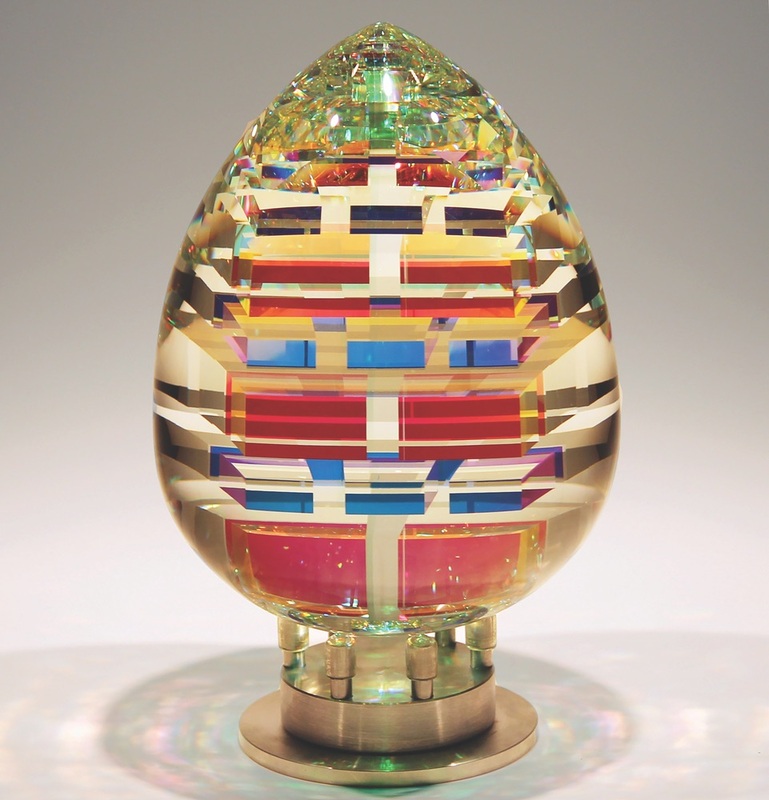 VIE: What sparked your interest in glass art? Jack Storms: I was never a particularly great student in school. Instead of listening in class, I was constantly doodling. So I had a lot of practice using my hands to translate my thoughts into images and sketches. I eventually started to move charcoal, paint, and clay the way I pictured it in my mind. My first job led me to glass, where I simply fell in love. VIE: Do you make a sketch of what you want a piece to look like first? JS: I start with a 2-D sketch drawing and map it out on graph paper. Then, from there, you have to know how many cuts and what type of glass you are going to be using. Then you understand the process you’re going to be embarking on for the piece’s construction. VIE: How long does each glass sculpture take to create? JS: The bare minimum for a piece is six weeks. Depending on the size and intricacy of the design, the longest can be up to twelve months. The Bella collection includes sculpted glass decanters, wine glasses, champagne flutes, martini glasses, and more. VIE: Your intriguing art has caught a lot of media attention—and rightfully so. What is it like looking back to before you even got into glasswork to where your journey has taken you? JS: I knew I would be successful; I just had no idea I would be this successful. I’m just trying to stay grounded and keep looking forward. VIE: Do you ever read the comments people post on your social pages or some of your videos? If so, what are your thoughts on all the positive feedback? Do you use it as inspiration? JS: Yes. It’s very humbling. I like to have the fans help name artworks from time to time. Their positive feedback definitely propels me to create. VIE: What’s your favorite thing you’ve ever created? JS: My favorite piece that I have ever created has to be the large Fantastik ViviOvo. I am only ever making ten and I will definitely be sad when they are done. My favorite piece that I have ever created has to be the large Fantastik ViviOvo. VIE: There’s an expression in the art industry—that famous two-word phrase, “starving artist” —and it exists for a reason. How did your parents take the news when you decided that your place was in the arts? JS: My parents were happy I was pursuing something. I was thirty years old by the time I graduated college, and they were just happy I finished the trek. At that point, I was all grown up and more concerned for my future than my parents were. VIE: Did you ever have any doubts or fears on earning a living? JS: No, not really. For me, there was no other option than to succeed. I always just concentrated on what I had to do that year, that month, that week, or that day to keep moving forward. VIE: What advice would you give to any artists trying to go after their dreams? Jack: Treat it like a business and an obsession. If you consider yourself a brilliant artist, then you have a duty to gain the patronage of people in order to support yourself. If you start out making things people are willing to pay for, you will end up owning your own studio where you will be free to chase your dream. The ViviOvo is Storms’s only muse-inspired sculpture, named for his wife, Vivian. VIE: If you could meet any three artists, living or dead, who would they be, and why? JS: Honestly, any of the four Ninja Turtles’ namesakes, if you will. The Renaissance masters have provided me with a lot of inspiration. They ushered in an era of art that based things off of nature using the Fibonacci principle and the golden ratio. VIE: Where do you see your art going in the future? JS: After some of the feedback from people, we are starting to create a jewelry line with more affordable designs of my work. That has kept me busy trying to translate the work to a miniature size. My hope is to give everyone an opportunity to own my work. VIE: We’re looking forward to following this sparkling journey! Interested in getting your hands on a piece of art by Jack Storms? 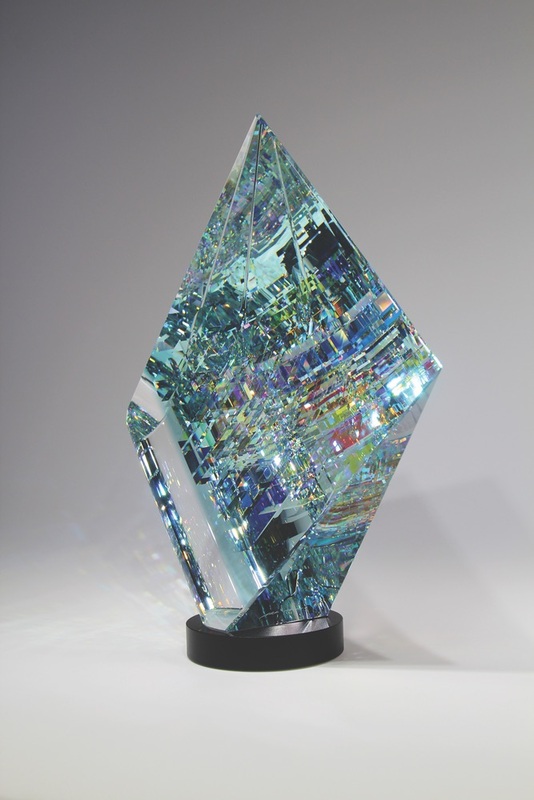 Due to the time-consuming process, his glass sculptures are sold only at select fine art galleries, including Storms Fine Art Gallery in Los Angeles and Marcus Ashley Gallery in South Lake Tahoe, California, and Christopher Egan Fine Art Galleries in Lahaina and Wailea, Hawaii. Special commissioned artworks can be made upon request and start at $30,000, but the results are so worth it. Follow along as Jack takes the contemporary glass art industry by storm when you check out his channels on YouTube, Instagram (@stormsjack), and Facebook.com/StormsArt. Learn more at JackStorms.com.